Chuan-Yi Kuo and Yi-Ting Chen contributed equally to this work. Neck dissection is often recommended as a surgical procedure for head and neck cancer because of the possibility of regional metastasis at an early stage of disease,. However, previous studies have demonstrated that manipulation of the carotid artery may induce ischemic stroke in patients with vascular atherosclerosis, possibly due to dislodgment of an existing thrombus or plaque [3-6]. The association between neck dissection and stroke has become a real clinical concern as the risk factors for stroke (i.e., older age, hypertension, and carotid artery stenosis) are not uncommon in patients undergoing neck dissection,, and perioperative stroke has been reported to be associated with an eight-fold increase in perioperative mortality within 30 days. However, information on the association between neck dissection and perioperative stroke remains inconsistent [10-12]. As the size of the elderly population and their life expectancy steadily increase, neck dissection is likely to be performed in elderly patients with head and neck cancers. In this patient subgroup, the prevalence of stroke following neck dissection is still poorly addressed. The aims of this study were (1) to compare the incidence of perioperative stroke and prevalence of predisposing factors in elderly patients (age ≥65 years) and their younger counterparts (age <65 years) receiving neck dissection, (2) to compare the prevalence of predisposing factors for perioperative stroke in both groups, and (3) to analyze the impact of preoperative patient characteristics on length of stay (LOS) in the elderly patients. Information from patients who underwent modified or radical neck dissection for major head and neck cancer at a tertiary referral center (E-Da Hospital, Kaohsiung City, Taiwan) from January 1, 2012, to July 31, 2016, was retrieved from an administrative hospital discharge database using the surgical codes for neck dissection. The administrative hospital database records all hospital admissions and includes information on diagnoses and procedures performed. The collected information, including patient data, diagnosis at discharge, date of admission, date of discharge, surgical findings, operative reports, discharge summaries, and length of hospital stay, was retrospectively reviewed. Cases of stroke were identified from the discharge diagnosis or a review of all outpatient clinic visits in the electronic medical record of patients receiving neck dissection. To verify the diagnosis and confirm that the cerebrovascular event was a new incident, one of the authors examined the medical charts, including admission notes, discharge summaries, consultation reports, physician daily progress notes, and diagnostic imaging reports. The study was reviewed and approved by the Institutional Review Board of E-Da Hospital. Informed patient consent was waived due to the retrospective nature of the study after obtaining approval from the Institutional/National Review Board Committee. The subjects recruited included all adult patients (age >18 years) who suffered from malignancy in the head and neck area, for which neck dissection was performed. Patients with incomplete data or those who underwent carotid endarterectomies were excluded. The patients were divided into the elderly group (age ≥65 years) and the younger group (age <65 years). Perioperative stroke was defined as an embolic or thrombotic cerebrovascular event with patient motor, sensory, or cognitive dysfunction, occurring during or within 30 days after surgery. The incidence of perioperative stroke was determined by dividing the number of perioperative strokes by the total number of neck dissections performed. Cases of hemorrhagic stroke were excluded from analysis. 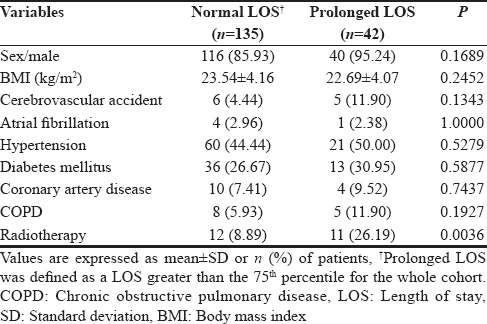 Postoperative LOS was defined as the time from the day of the index operation to either the date of death in cases of postoperative mortality or the day of discharge from the hospital, while prolonged LOS was defined as a postoperative LOS greater than the 75th percentile for the entire cohort. Data are expressed as mean ± standard deviation or number (%) of patients. Characteristics of patients and predisposing factors were stratified by age using the age of 65 as the cutoff point. Student's t-test was used for continuous variables, and the Chi-square test or Fisher's exact test was used for analysis where appropriate. 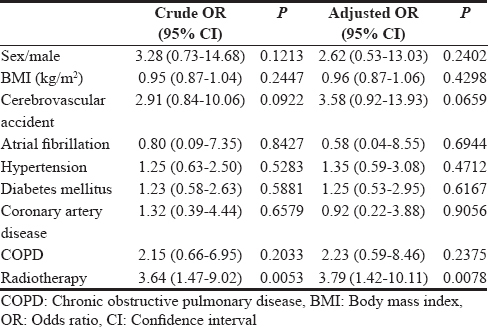 Univariate and multivariate analyses were performed to analyze the impact of preoperative patient characteristics on LOS. All variables associated with P < 0.05 on univariate analyses were included in logistic regression models for multivariate analyses. The statistical analysis was performed with SPSS software version 22.0 (SPSS Inc., Chicago, Ill, USA). The level of significance for all P values was set at P < 0.05. During the study period (January 2012–July 2016), data were obtained from 1057 head and neck cancer patients who underwent neck dissection. Patient characteristics, stroke incidence, and hospital stay for both groups are summarized in [Table 1]. 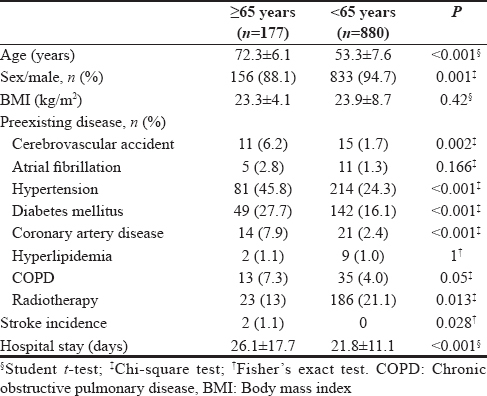 The elderly group was significantly older than the younger group (P< 0.001) with no differences in body mass index or history of atrial fibrillation, hyperlipidemia, or chronic obstructive pulmonary disease (COPD) between groups. Younger patients were more likely to be male (P = 0.001) and to have received radiotherapy (P = 0.013). The prevalence of predisposing factors was higher in the elderly including history of cerebral vascular accident (P = 0.002), hypertension (P< 0.001), diabetes (P< 0.001), and history of coronary artery disease (P< 0.001). Furthermore, elderly patients had longer hospitalizations (P< 0.001) [Table 1]. After univariate [Table 2] and multivariate logistic regression [Table 3] analyses, previous radiotherapy was found to be an independent risk factor for prolonged LOS in the elderly patients (adjusted odds ratio: 3.79 [95% confidence interval: 1.42–10.11], P = 0.0078) [Table 3]. Of the 1057 head and neck cancer patients receiving neck dissection, two experienced perioperative strokes (0.19%). Both patients were in the elderly group (2/177, 1.1%), whereas no ischemic strokes occurred in the younger group (0/880, 0%). The incidence of ischemic stroke after neck dissection was significantly higher in the elderly population than their younger counterparts (P = 0.028). One of the two patients with stroke was a 72-year-old hypertensive man who had an ischemic stroke contralateral to the surgical site. Imaging did not demonstrate stenosis of the carotid arteries. The second patient was an 82-year-old man with hypertension who suffered from bilateral ischemic stroke after bilateral neck dissection. Imaging revealed total occlusion of the right internal carotid artery. Neither patient had a history of a cerebrovascular accident or atrial fibrillation. Anesthetic records of both patients revealed several episodes of significant hypotension (<40% baseline systolic blood pressure) during surgery. Perioperative stroke is associated with a significant increase in perioperative mortality. As the association between neck dissection and stroke is a clinical concern and old age is a significant predisposing factor for perioperative stroke, characterization of the incidence of stroke after neck dissection in elderly patients (age ≥65 years) may allow preoperative counseling for high-risk patients. Our results demonstrated a significantly higher incidence of perioperative ischemic stroke in elderly patients than in their younger counterparts after neck dissection. In 1993, Nosan et al. reported a stroke incidence of approximately 4.8% among 105 patients who underwent neck dissection, highlighting a high risk of stroke during or after neck dissection. However, subsequent studies do not seem to support this association [10-12]. Thompson et al. reported a stroke incidence of 0.2% (n = 499) and MacNeil et al. reported a stroke incidence of 0.7% (n = 14837) following neck dissection. Chang et al. recently reported that the surgical technique chosen for neck dissection may not increase the risk of ischemic stroke in the Taiwanese population. Although carotid artery stenosis is the single most important risk factor for stroke, there is no consensus on the need for routine preoperative Doppler sonography screening for possible carotid artery stenosis in patients scheduled for neck dissection in real-world clinical practice. The reasons for these conflicting findings on the association between neck dissection and stroke incidence in the literature are unknown. One possible explanation is that some high-risk patients, such as those with a history of carotid artery stenosis or those who have received chemoradiotherapy, were excluded from these studies. The exclusion, therefore, may have caused bias because of selection of patients with less severe conditions. Another possible explanation may be the inclusion of relatively young patients in these studies [10-12]. As perioperative stroke remains rare, the inclusion of the younger age group may also have biased results toward selection of low-risk patients. The overall incidence of stroke for elderly patients (i.e., ≥65 years) undergoing head and neck tumor surgeries, regardless of the extent of the operation, has been reported to be about 0.1%. By comparison, our study showed that the incidence of stroke in the elderly population after more extensive surgery (i.e., neck dissection) was 1.1%. Our finding, therefore, may highlight a higher risk for perioperative stroke in elderly patients undergoing neck dissection compared with those receiving less extensive head and neck operations. A possible explanation may be that neck dissection often involves retraction of the carotid artery, which may dislodge a thrombus or plaque in patients with preexisting carotid artery atherosclerosis. One of the two patients with perioperative stroke in the present study was found to have carotid arterial stenosis after the operation, supporting the potential benefit of routine Doppler sonography for elderly patients undergoing neck dissection, as endorsed by a previous study. The present investigation had some merits over previous studies [10-12]. First, the inclusion of all patients with head and neck cancer receiving neck dissection may better reflect the overall incidence of ischemic stroke in the study population. Second, in concert with the study by MacNeil et al., who reported a decrease in the incidence of ischemic stroke following neck dissection over time (i.e., 1.1% from 1995 to 2000 vs. 0.3% from 2007 to 2012) possibly due to improved perioperative patient care, risk optimization for ischemic stroke, and improved surgical techniques, our data showed an incidence of 0.19% from 2012 to 2016. Variations in the pathogenesis of stroke may lead to a racial disparity in the incidence of stroke. It has been reported that intracranial atherosclerosis is more prevalent in Asian patients, whereas extracranial atherosclerosis is more common in Caucasian patients,. As manipulation of the carotid artery may carry a risk of dislodging a thrombus or plaque, it is reasonable to hypothesize that the Caucasian population may be at higher risk of perioperative stroke than the Asian population after neck dissection. Since the incidence of stroke associated with neck dissection remains poorly addressed in elderly Caucasian patients, future studies are needed to support the hypothesis. In the present study, one hypertensive patient without carotid artery stenosis developed ischemic stroke contralateral to the surgical site. The pathogenesis of ischemic stroke, in this case, was suspected to be multifactorial and possibly associated with the presence of intracranial atherosclerosis and significant intraoperative hypotension. Intraoperative hypotension, which is defined as a drop in the mean blood pressure by 30% or more, has been recognized as a predisposing factor for perioperative stroke and may be overlooked in patients with preoperative high blood pressure. As the prevalence of hypertension was high in elderly patients with head and neck cancer (i.e., 45.8% in the current study), control of hypertension before surgery and maintaining a stable intraoperative hemodynamic profile may be beneficial in preventing perioperative stroke. In patients undergoing elective head and neck surgery, preoperative patient characteristics that contribute to prolonged LOS have been reported to include old age, poorer functional status, alcohol consumption, history of COPD, and diabetes mellitus. However, few studies have specifically assessed the predictors of prolonged LOS in elderly patients undergoing neck dissection. We found that previous radiotherapy was an independent risk factor for prolonged LOS in this patient subgroup. Benatar et al. also reported that preoperative radiotherapy was associated with prolonged LOS in patients undergoing head and neck microvascular reconstruction although the impact of age was not evaluated. Preoperative radiotherapy is commonly associated with difficult surgical dissection and increased wound-related morbidity, which may explain the findings in our report. There were several limitations of the current study. First, although it has been demonstrated that stroke patients can be identified from an administrative database with high sensitivity and specificity, hospital administrative data are often collected for billing purposes which may lead to bias in this historical cohort study. Second, this study was conducted in a single-hospital setting, and detailed information about patient characteristics (e.g., smoking), doses of chemoradiotherapy, and intraoperative hemodynamic profiles were not available. Third, the code for neck dissection does not differentiate between radical, modified radical, or selective neck dissection, so comparison could not be made among patients receiving different degrees of dissection. Finally, because of the small sample size, sample bias may exist. For instance, only two patients experienced ischemic stroke even though over 1000 patients undergoing neck dissection were collected over a period of 4.5 years. The use of Fisher's exact test may not reflect the true statistical significance of the data. The present study showed that elderly patients were at higher risk of developing ischemic stroke following neck dissection compared with their younger counterparts. The presence of carotid artery stenosis and significant hemodynamic changes appeared to contribute to the occurrence of perioperative stroke. Previous radiotherapy was an independent risk factor for prolonged hospitalization in the elderly population. Better perioperative patient care and risk optimization for ischemic stroke may be required in elderly patients undergoing neck dissection. Pillsbury HC 3rd, Clark M. A rationale for therapy of the N0 neck. Laryngoscope 1997;107:1294-315. Nosan DK, Gomez CR, Maves MD. Perioperative stroke in patients undergoing head and neck surgery. Ann Otol Rhinol Laryngol 1993;102:717-23. Khaffaf N, Karnik R, Winkler WB, Valentin A, Slany J. Embolic stroke by compression maneuver during transcranial Doppler sonography. Stroke 1994;25:1056-7. Beal MF, Park TS, Fisher CM. Cerebral atheromatous embolism following carotid sinus pressure. Arch Neurol 1981;38:310-2. Yeh YC, Sun WZ, Lin CP, Hui CK, Huang IR, Lee TS. Prolonged retraction on the normal common carotid artery induced lethal stroke after cervical spine surgery. Spine (Phila Pa 1976) 2004;29:E431-4. Cheng SW, Wu LL, Ting AC, Lau H, Lam LK, Wei WI. Irradiation-induced extracranial carotid stenosis in patients with head and neck malignancies. Am J Surg 1999;178:323-8. Carmody BJ, Arora S, Avena R, Curry KM, Simpkins J, Cosby K, et al. Accelerated carotid artery disease after high-dose head and neck radiotherapy: Is there a role for routine carotid duplex surveillance? J Vasc Surg 1999;30:1045-51. Mashour GA, Shanks AM, Kheterpal S. Perioperative stroke and associated mortality after noncardiac, nonneurologic surgery. Anesthesiology 2011;114:1289-96. Thompson SK, Southern DA, McKinnon JG, Dort JC, Ghali WA. Incidence of perioperative stroke after neck dissection for head and neck cancer: A regional outcome analysis. Ann Surg 2004;239:428-31. MacNeil SD, Liu K, Garg AX, Tam S, Palma D, Thind A, et al. A population-based study of 30-day incidence of ischemic stroke following surgical neck dissection. Medicine (Baltimore) 2015;94:e1106. Chang CF, Kuo YL, Pu C, Chou YJ. Neck dissection and stroke in patients with oral cavity cancer: A population-based cohort study. Head Neck 2017;39:63-70. BuSaba NY, Schaumberg DA. Predictors of prolonged length of stay after major elective head and neck surgery. Laryngoscope 2007;117:1756-63. Calliada F, Verga L, Pozza S, Bottinelli O, Campani R. Selection of patients for carotid endarterectomy: The role of ultrasound. J Comput Assist Tomogr 1999;23 (Suppl 1):S75-81. Atik MA, Ates M, Akkus NI, Altundag O, Altundag K. Preoperative Doppler sonography for prevention of perioperative stroke in head and neck cancer patients undergoing neck dissection: Is it beneficial? J Clin Ultrasound 2007;35:38-9. Kim BJ, Kim JS. Ischemic stroke subtype classification: An Asian viewpoint. J Stroke 2014;16:8-17. Man BL, Fu YP. Concurrent stenoses: A common etiology of stroke in Asians. World J Clin Cases 2014;2:201-5. Bijker JB, Persoon S, Peelen LM, Moons KG, Kalkman CJ, Kappelle LJ, et al. Intraoperative hypotension and perioperative ischemic stroke after general surgery: A nested case-control study. Anesthesiology 2012;116:658-64. Benatar MJ, Dassonville O, Chamorey E, Poissonnet G, Ettaiche M, Pierre CS, et al. Impact of preoperative radiotherapy on head and neck free flap reconstruction: A report on 429 cases. J Plast Reconstr Aesthet Surg 2013;66:478-82. Tirschwell DL, Longstreth WT Jr. Validating administrative data in stroke research. Stroke 2002;33:2465-70.